Starting from Shiva himself, many great beings chose to deposit and preserve their work in Kailash. Rishabadev, the saints of the Bon religion, two of the greatest Buddhist teachers, Agastyamuni, the Nayanmars, Sage Vyasya, Adi Shankracharya– all of them chose Kailash Parvat.- Sadguru. Uttarakhand is a northern state of India and often reffer to as Devbhoomi- The land of Gods, becasuse of many Hindu temples and pilgrimage centre found in the state.Uttarakhand is also known for its mesmerising beauty of Himalayan region.The Himalayan ranges have many sacred peaks & mountains associated with 'Lord Shiva' i.e. Kedarnath, Mt. 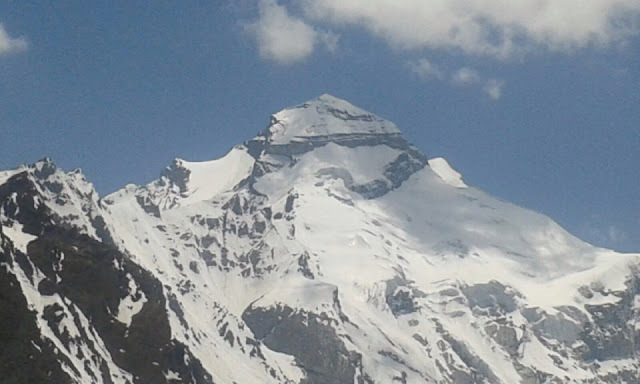 Kailash, Manimahesh kailash, Kinner Kailash, Shrikhand Kailash, Adi Kailash, Neelkanth, Trishul, Shivlinga and others. Panch Kailash: Panch kailash is five sacred Kailash peaks in the himalayan region is best known for abodes of Lord Shiva. Mt. 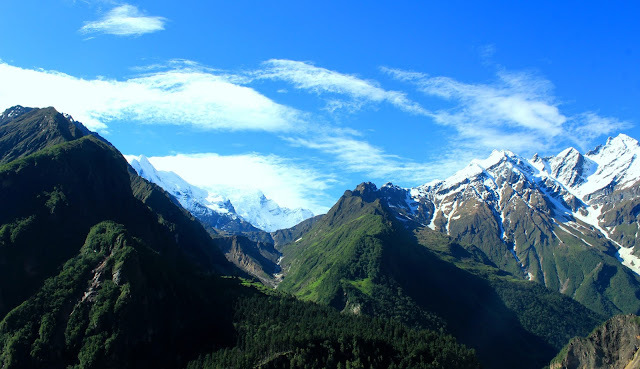 Kailash in Tibbet is the best known Kailash, three Kailash peaks ( Kinner Kailash, Shrikhand Kailash, Manimahesh Kailash) are located in Himachal Pradesh. 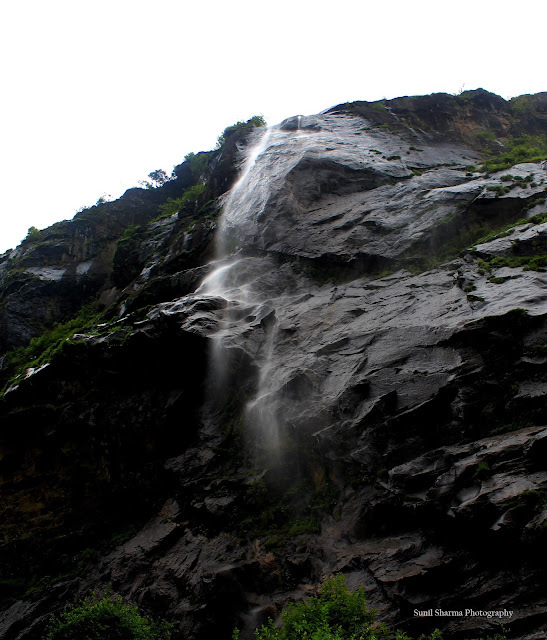 And one is located in kumaon region of Uttarakhand known as Adi Kailash or Chota Kailash. ADI KAILASH TREK: Mt. 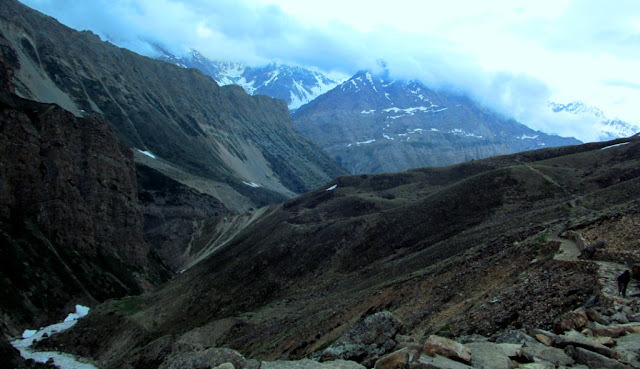 Adi Kailash(6091m) - populerly known as Chota Kailash, is in Indian territory close to the India-Tibet border. Adi Kailash peak is located in Dharchulah district of Uttrakhand state, and situated at an altitude of 15,500ft. and is the replica of Holy Mt. 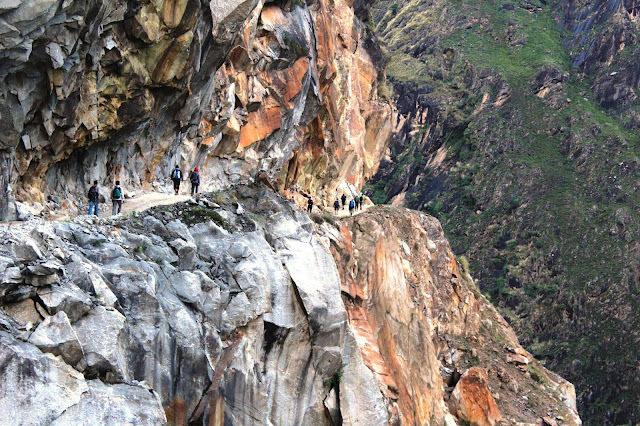 Kailash, it is an area of great netural beauty, peace and serenity in the great Himalaya. 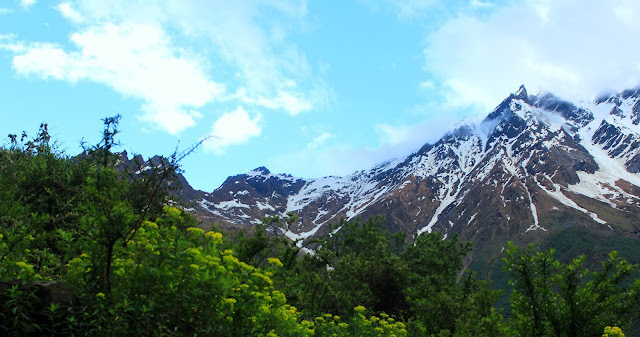 Adi Kailash is only peak in the range which has great fame among the Indians trekkers and pilgrims due to its sacred status and spectacular profile. 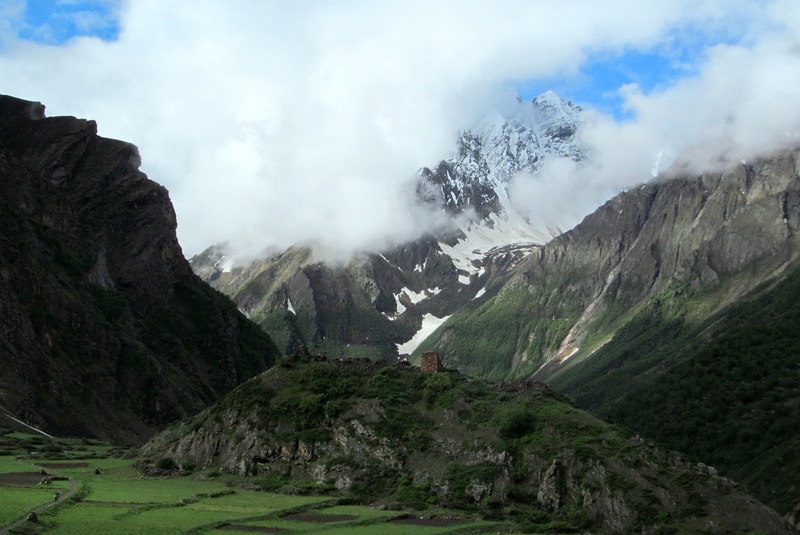 Adi Kailash is considered Lord Shiva's oldest abode. It is a place where Pandava Brothers and sage Vyasa lived and meditate for a long time. 'Ravana' is the biggest follower of Lord shiva. Ravana comes from south(Lanka) to the far north Adi-Kailash to pray Lord Shiva. 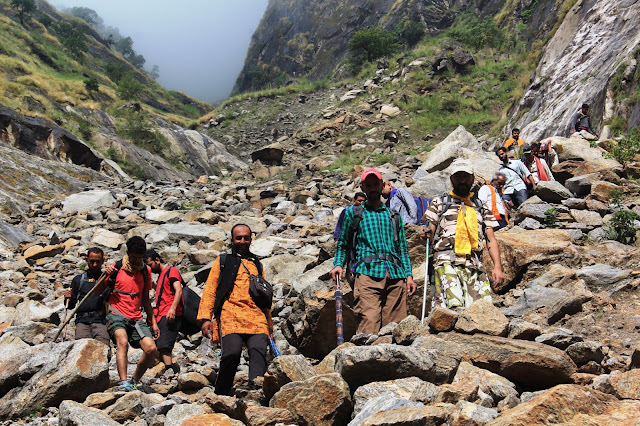 This year (2015) we were planing for our Panch Kailash trekking destination and we decide to trek Adi kailash which is one of the oldest abode of Lord Shiva in Uttarakhand, all our trekking friends agreed for this new and exciting trek. We are a group of trekkers & pilgrims from Theog, district Shimla of Himachal Pradesh. 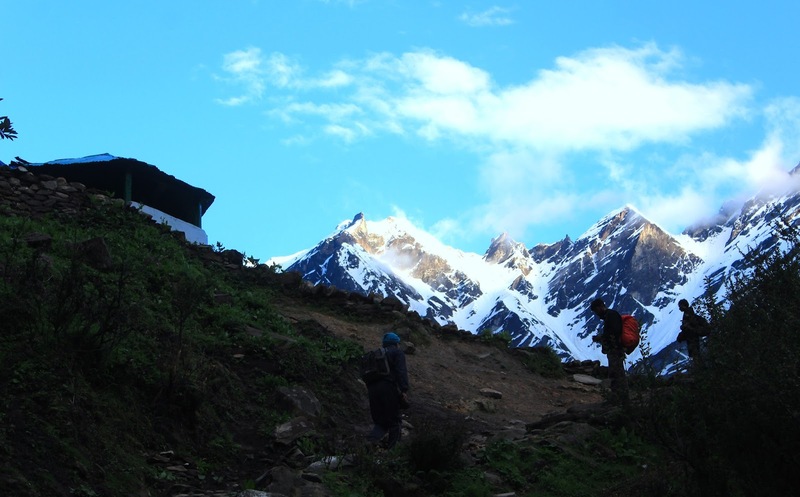 This is the 3rd or 4th Kailash Destination for all trekkers and pilgrims in the group. Some group member have aim to do a Panch Kailash Yatra in there life and became Kailashi. We booked mini volvo bus for travelling and loaded it with all traveling meals and other needy things on the route. Our journey started on 17th june 2015 from Theog, Shimla. First Leg: Shimla To Haridwar- It is 300km from Shimla. 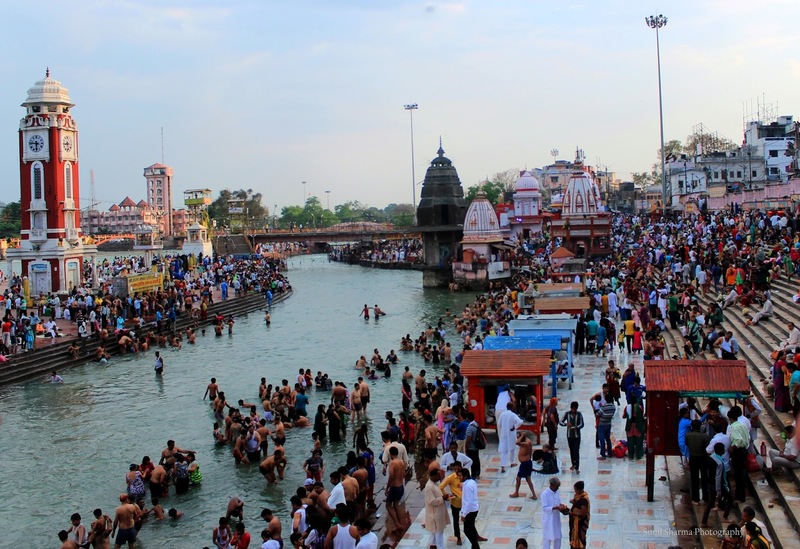 We reached Haridwar at night and stay over night at Baba Rudranand Ashram..18th june morning we get up early and took holy bath in river Ganga, it feels very refreshing and divine. Second Leg: Haridwar to Jageshwar-On june 18th after breakfast we leaving for Jageshwar. Around 8pm. we reached Jageshwar Dham, it is very long and very refreshing journey to Jageshwar.We stayed one night there and visited Jageshwar Dham next morning. JAGESHWAR DHAM: On 19th june we visited Jageshwar Dham. Jageshwar a Hindu pilgrimage town in Amora district. 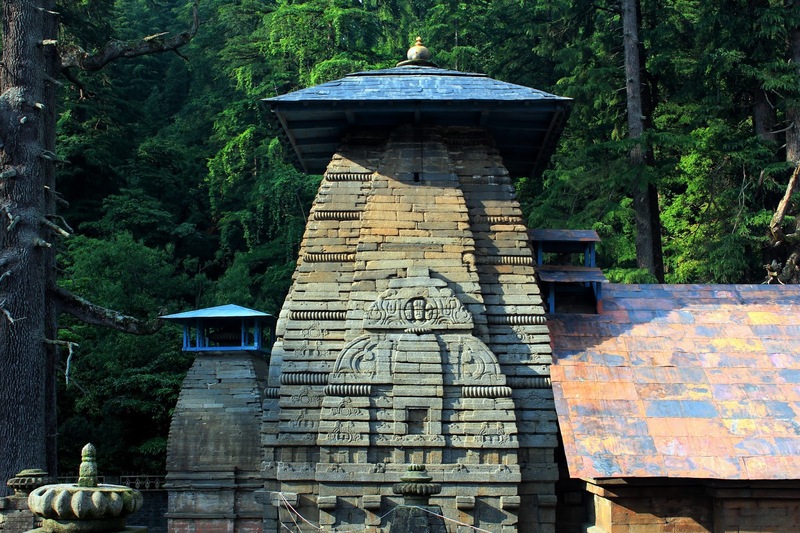 It is largly believed that Jageshwar dham is associated with twelve joyitirlinga. Jageswar Dham has a Jyotirlinga which is dedicated to Lord Shiva. The temple town comprises a group of 124 small and large temples. It is also believed that Guru AdiShankracharya visited here and renovated Jageshwar temple and reestablished many temples before leaving for Kedarnath. 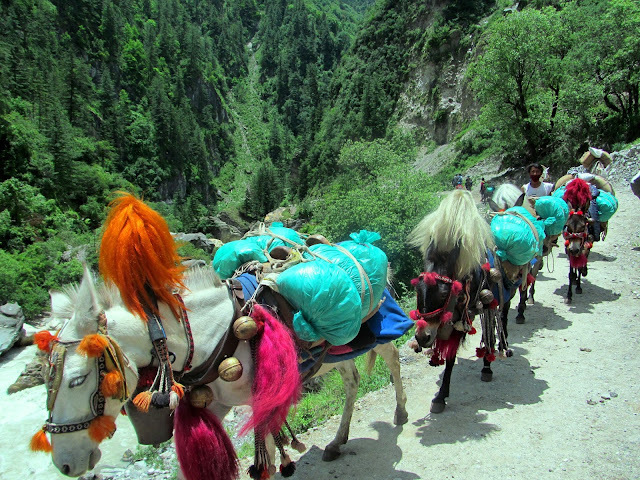 Third Leg: Jageshwar to Dharchullah- On 19th june we proceeded to Dharchullah via Pithoragarh which is around 300km. from Jageshwar. 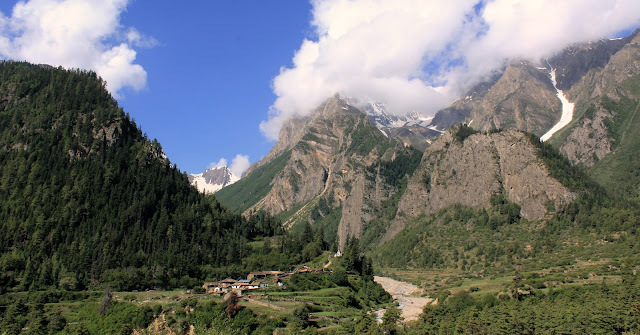 The route is very scenic and going through the thick forest of devdar and chir, on the other side of the valley we saw the peaks of Nanda Devi and Panchchuli its a mesmerising experience.We reached Dharchullah at night around 9pm. we stayed in a hotel there. 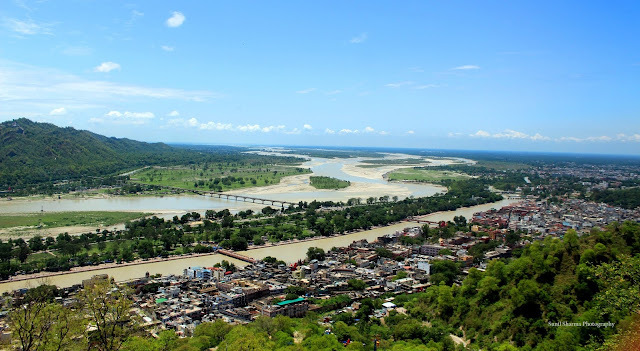 DHARCHULAH: Dharchulah is situated on the banks of the river Kali on the other side of river is Nepal. Dharchulah was an ancient trading town on the trance himalyan trade routes. After Indo-Chhina war in 1962 trading conactions and ties with Tibetan came to stop. Dharchulah shares its boundry with both country with China and Nepal.ITBP & SSB forces gaurding the boundry of the region. 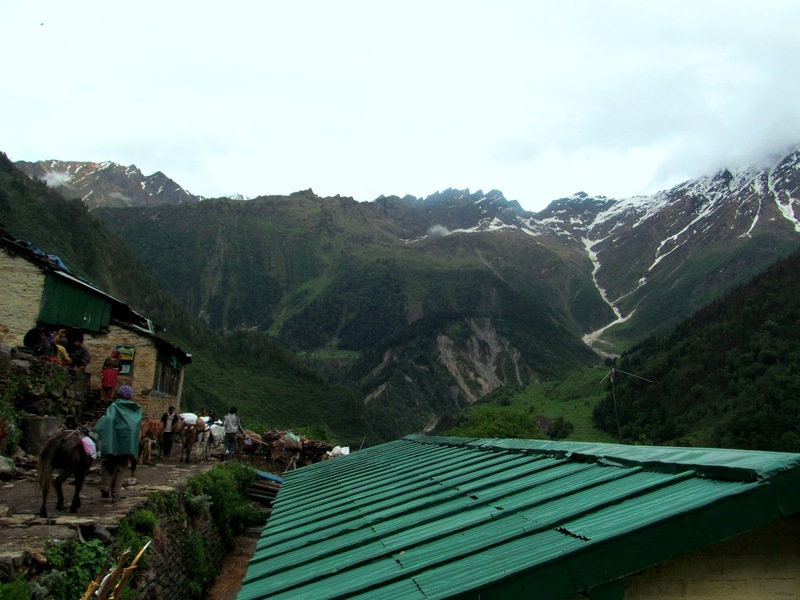 It is the base camp for Kailash Mansarovar and Adi Kailash Trek. KMVN organised yatra for Kailash Mansarovar and Adi Kailash every year. For private groups and trekkers Trek permit and Inner Line Permit is required from District Magistrate Dharchullah. We took the permits and move on to our base camp at Pangla.There is SSB base camp and cheking point. We parked our bus there and booked rooms in local groccer sellers building, stay over night and pack our bags and rucksacks for the trek. Fourth Leg: Pangla-Malpa-Budhi- Chiyalekh- On 21th June, we are invited by the SSB C.O. for the breakfast.He brief us about the yatra trek and do and dont's in trek.After breakfast we returen to our room and get ready for the trek. We headed to Garbadhar village by zeep 8km. from Pangla. Our trek begins from Garbadhar. sight.There is two routes from Garbadhar to reach Lakhanpur, one from Gala point and other is locals shot-route along the river.We took locals route. we reached Lakhanpur very early. We took some snacks and tea there. 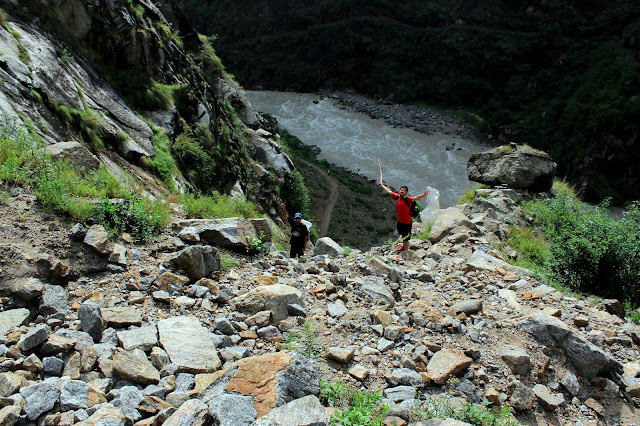 The next strech of the trek was very dangerous and exhilarating too. Lean wild streams flowing down the steep slopes bringing pebbles and boulders.The main section of the road is carved out the blocks of verticle rock. We walked through the rising rock on the left and open edge of vertical fall of 50 ft. or more to river Kali.We were following up Kali through the narrow valley. We reached Malpa by 1 O'clock. It is on the bank of river Kali, surrounded by mountains with sharp edges of steep rocky walls.We stayed for a while there.There is a tragic memory of the 1998 monsoon. A cloudburst happening in the valley caused an avalanche throwing down the huge mass of rocks and debris on the yatris, locals, army people, when they were resting in their huts and tents.That was really tragic.We prayed for them and move forward to Budhi. We reached Budhi camp by 3O'clock. Budhi is a mountaious village elivation of 9000ft., situated on the banks of Kali river and surrounded by snowcaped mountains, lushing green valley and Kali river in the background. 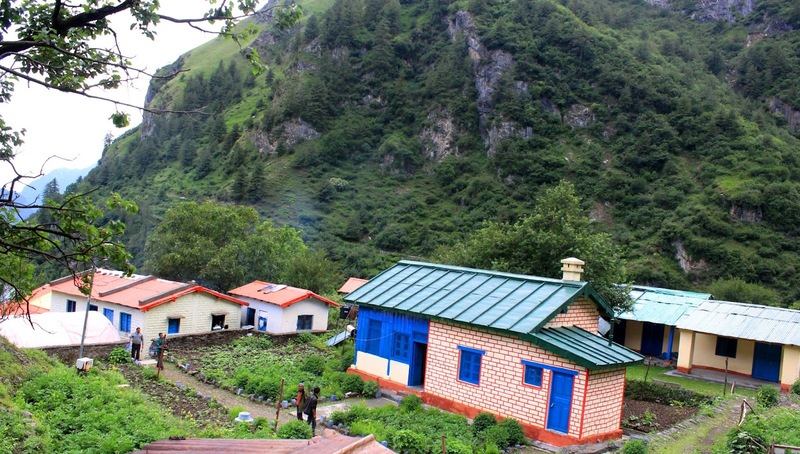 It is the second base camp for Kailash yatris and their porters or mules who carried their luggage upto kailash..At Budhi here is a PCO & KMVN Rest House for Kailash Yatris and Trekkers. Budhi locals also provide eat and stay facilities for the Yatris and Trekkers. Border Forces and District authorities set a tansit camp here, locals guides and porter register their identities and get yatra permit also from Budhi.We had a great lunch there, the menu was hari sabji, chatni and chapatis. 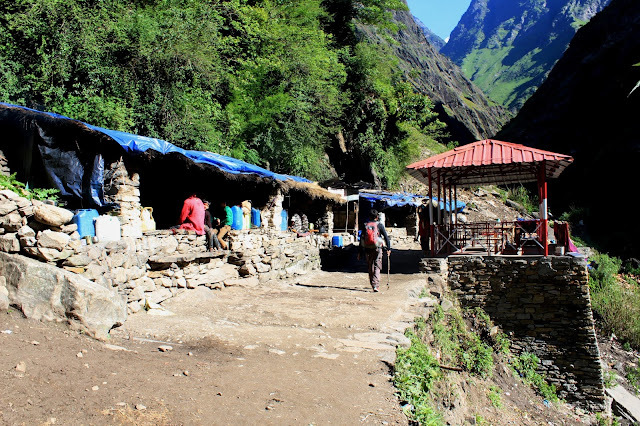 There are 2-3 shops at Budhi , one can buy there needy things for the trek such as batteries, torche, trek food, umbrella, woolen socks and cap, bandages etc. We left Budhi after 2 hrs. 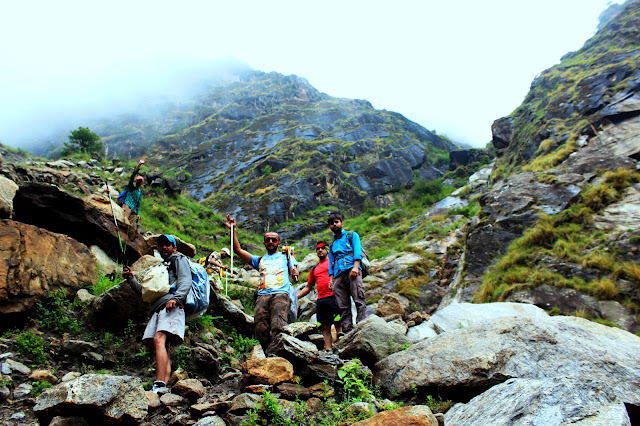 halt to climb Chiyalekh (The Valley of Flowers) .Its a steep climb of 5 km to the beautiful valley of flower. We reached at Chiyalekh in the evening.In the local language lekh means pass.Chiyalekh is situated at the elevation of 3350m. The beauty of Chiyalekh is very captivating and breathtaking. 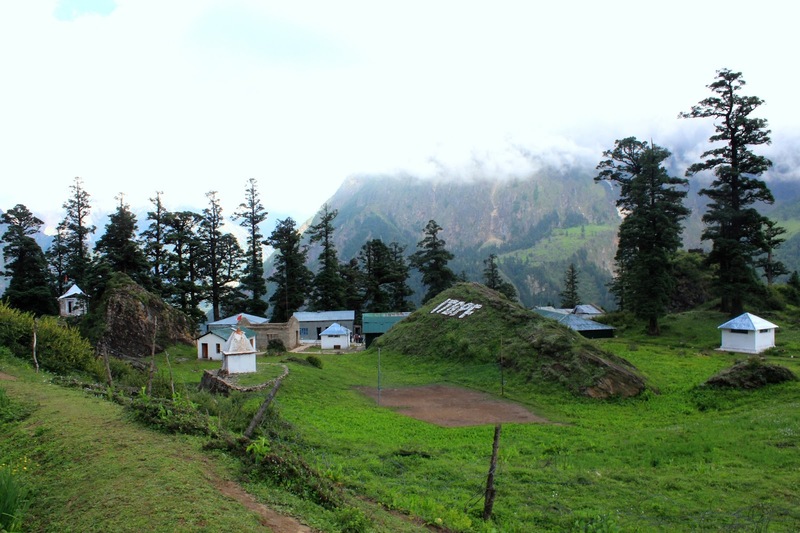 The lap of great Himalyan range , pine forest, lush green grass land with variety of wild flowers, fern, herbs and bushes commit to stop the trekkers and pilgrimage at Chiyalekh. 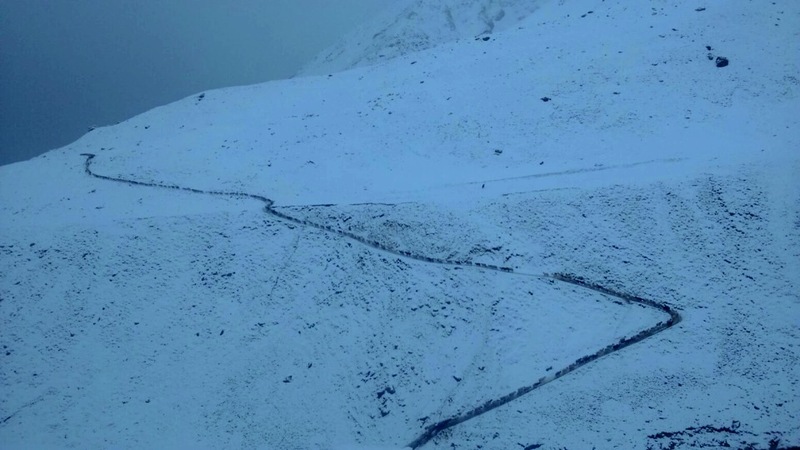 The road to Mount Kailash & Adi- Kailash is constructed and maintained by PWD Dharchulah & BRO. The scenery on the route (Pangla to Chiyalekh) was very beautiful with roaring Kali river, high sharp edgy mountains, snow capped Himalayan peaks green valley and waterfalls.We stayed over night at ITBP camp Chiyalekh, they gave us food and sleeping bags..The border forces are very cooperative and always ready for help to pilgrimage and trekkers. Salute to them. 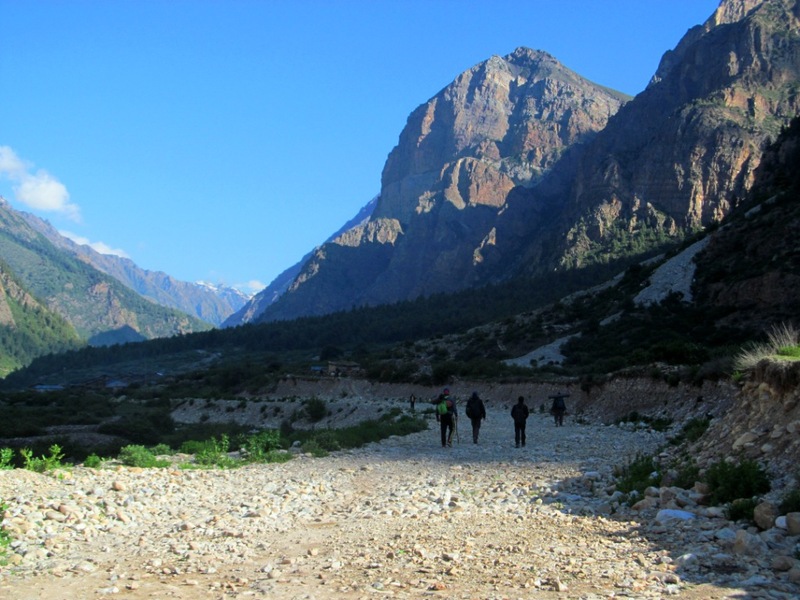 Fifth Leg: Chiyalekh-Garbyang Gunji- On this day we got up early in the morning, took tea & snacks in the ITBP mess and packed up for today's trek. The place had ITBP chekpoint, where our permits were checked. 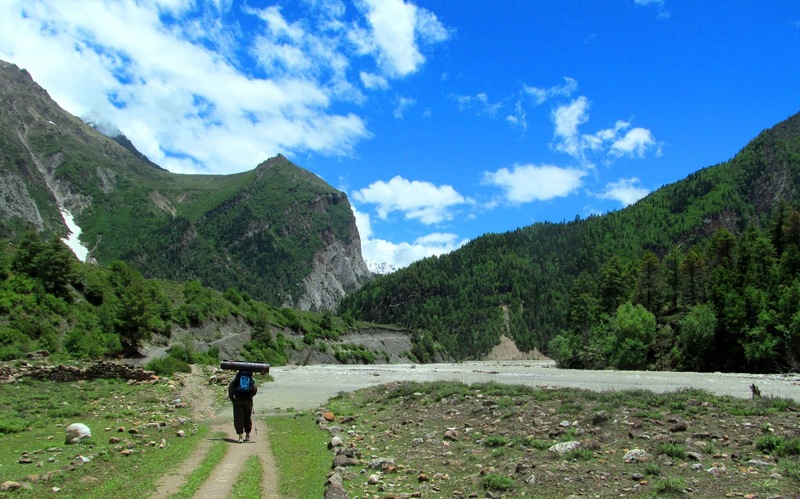 Walking through the valley was the beautiful stress free and very energetic. After 4 km.walk we reached Garbyang (Lunch Halt). 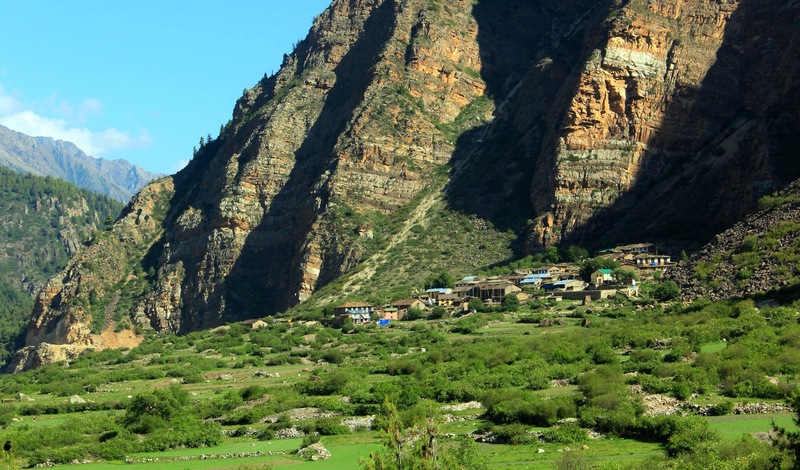 Garbyang is an ancient village in the lap of Himalaya. Garbyang was infamous Indo-Tibetian bisiness centre for India in the past . The village has lost his value and importance due to Indo-China War in 1962. 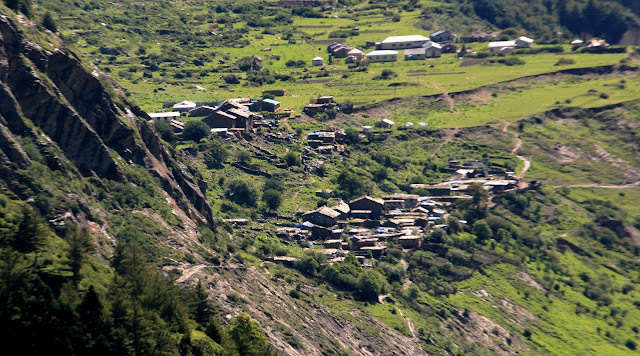 Garbyang is one of the rich cultured Himalayan village. In the past Garbyang known as 'Chota Vilayat' but today it is known as 'Sinking Village' because its houses were sinking due to geological catastrophic reasons. At Garbyang our permit was checked again the border forces enter every permit on the route. After checking we proceeded to Gunji. Towards evening we crossed small villages, there are lots of flowers and green cultivated fields ; plantation of cabbage, peas and potatoes was most engaging.We reached Gunji in the late evening. 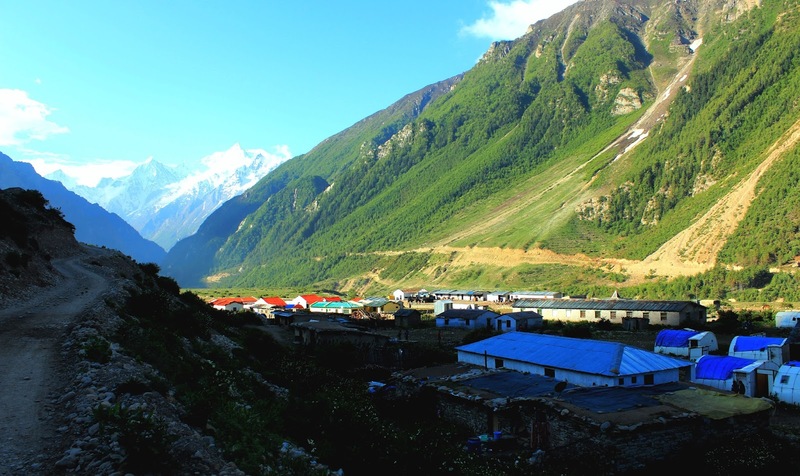 Gunji was our night halt.Gunji is a village near Nepal and China Border and confluence of the Kuti and Kali river. The village locals runs small trade shops where imported Chienese stuffis sold. We stayed at KMVN rest house at Gunji. The facilities provided by KMVN staff was awesome.Gunji is an entry point to Adi Kailash and Holy Mount Kailash. Up to Gunji the route is same , from here the route is divide in two way one to Adi Kailash region and other going to Om Parvat and Lipu Pass(Kailash Mansarovar region Tibet). On the route we walked through the Nabi village, Ronkong village ( A Village acroos the river Kutti). 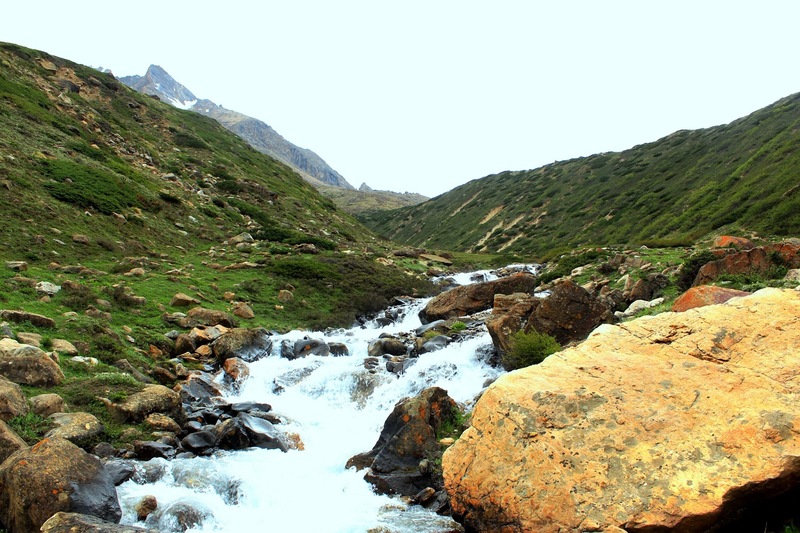 Kutti valley is a paradise of Himalaya , walks in the valley feels like we walks in the kingdom of heaven. Kutti river lay under huge snow at many points playing hide and seek. After 10 km trek we reached at Nampha (lunch Halt). After lunch we headed to Kuti. 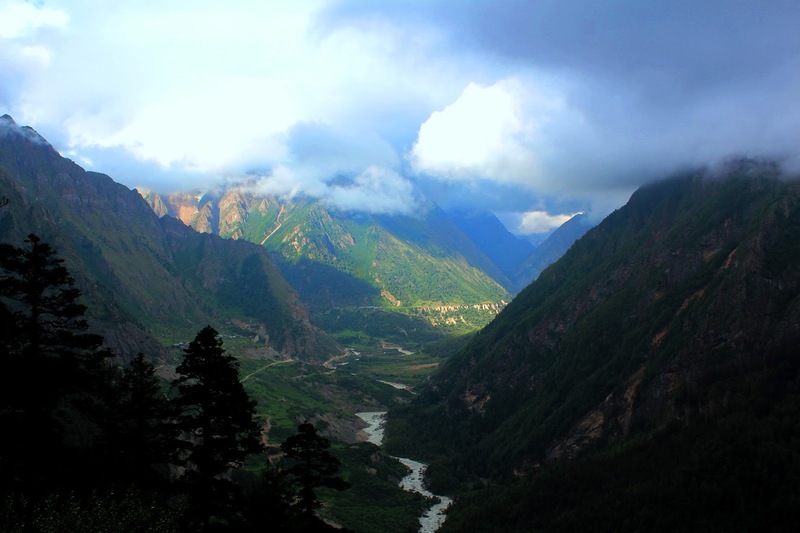 From Nampha,trek route is wide and flat through a meadow. Kutti (3780m) is a last village on the route.We reached Kuti around 2p.m. 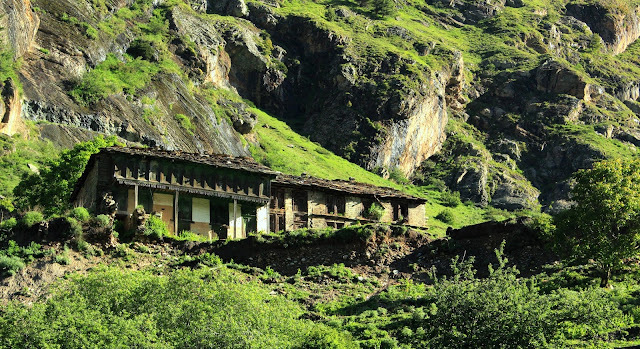 Kuti is a picturesque village in the lap of Himalaya. There is a world very different from ours, away from pollution and noise, covered by greenery and quietness.Its an elite village in the valley with good houses and rich culture. One member in every family is an engineer, doctor, or some other official and has migrated. Bhotia people are living in the valley. There is a hilltop with some old broken structure. Villagers believe that Pandava brothers lived here during vanvas. 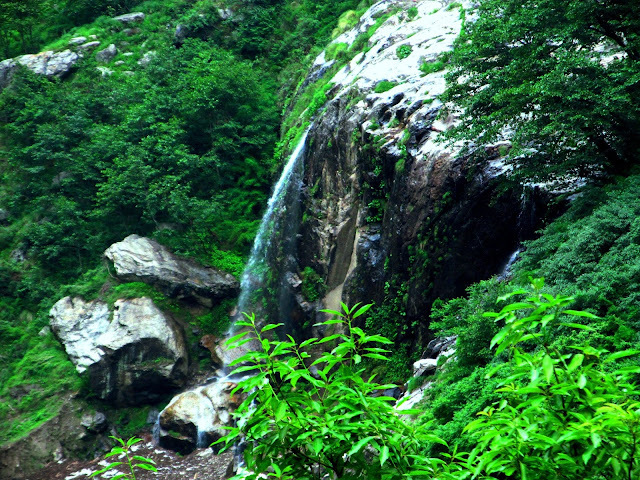 The Bhotia people of the valley also believe that sage Vyasa lived here for a long time to write the epics. 'Kuti' name comes from the Hindi word Kutia, meaning hut. Kuti's Kot or Killa ( Fort) lies on the big rock outside the village. The fort was built and occupied by Pandava brothers. It was ruined almost, some of the walls are still standing. 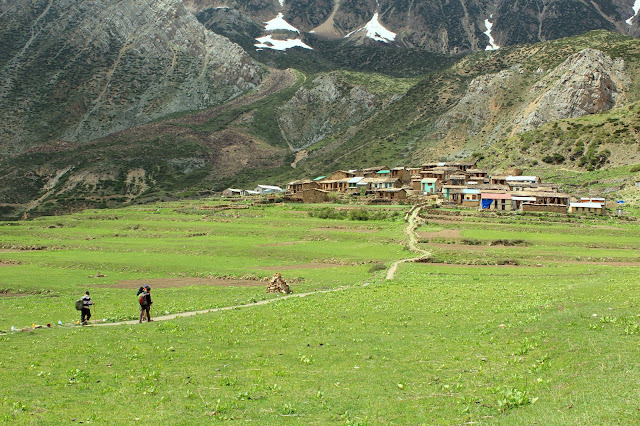 Walks in the villages of Malpa, Budhi, Grabyang(Sinking Village) , Gunji, Nabi and Kuti are very cultural and exhilarating. Around 3P.M. we headed to Jonglikong our formost target to Adi-Kailash.This is the last stretch to reach the foot of Mt. Adi-Kailash (6091m) The trek to Jonglikong From Kutti is about 15 km. 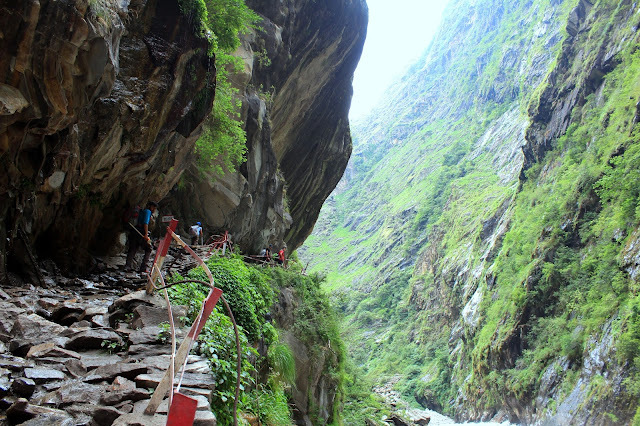 In this route there are no tea shops nor any human settlement. The path to Jonglikong(4270m) sometime goes up and sometime goes down, It is a very challenging stretch on the route, the route was very dull and dry. 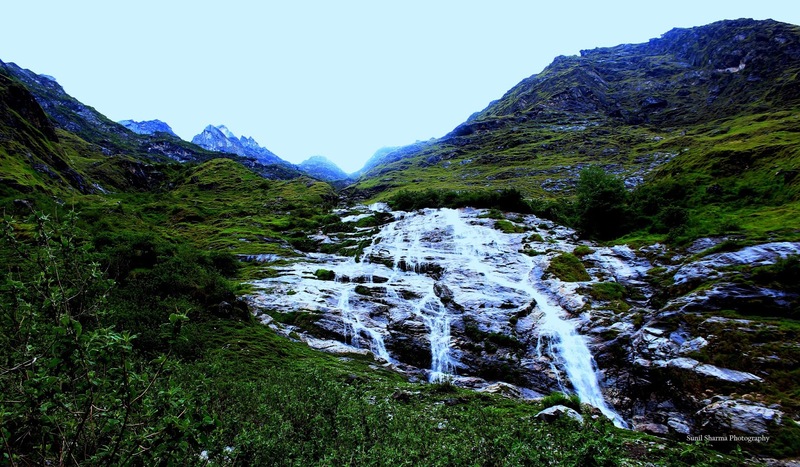 the trek mostly on the moraines and stony grass patches. The altitude and lack of oxygen level slowed our pace. The thick cloud of mist hide the snow capped mountain ranges on all side. We reached ITBP chekpost at 7:30 pm.ITBP personnel accorde a warm welcome to us, they chek our inner line permit and taken us to KMVN fiber huts. After 1/2 hr. walk on the snowy path we reached KMVN camps . The weather was very cold and start snowing. The KMVN had a great arrangements at Jonglikong(4270m). The KMVN staff provide good bedding(Rajai & Blankets.) and cooked kichadi for us. After a dinner of khichadi , we were all in the beds by 9:30pm. 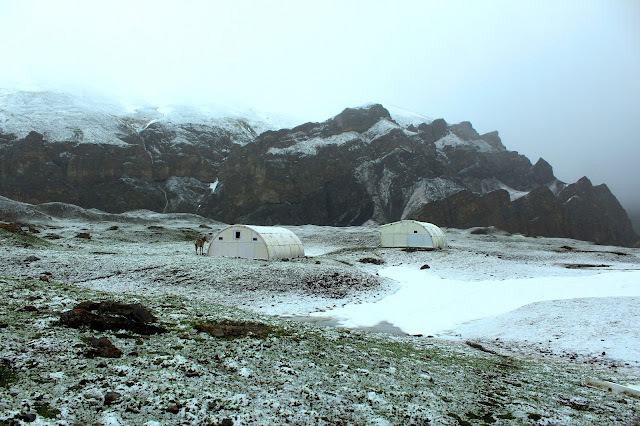 The temprature is very low in the night and its snowing all night, but the fiber huts provide good insulation from cold.Next morning we wake up at 8am, there was heavy raining outside we stayed in the hut for whole day & night. Seventh Leg: Jonglikong-Adi Kailsh-Jonglikong-Kutti- After one day & night wait, today was the day to reach the base of Mount Adi Kailash. It is a 3 km. hike from the camp.Today the weather conditions was also not in our favor, the sky was very cloudy, rain and snow was coming continuously, it is very tough to approach Gouri kund.We reached a rain shelter on the half way to the foot of Adi Kailash. Earlier local guide told us that it is the place where we also take holy darshan of Mount Adi Kailash, but Adi-Kailash is not that kind of mountain to give darshan all the time. We waited there for 2 hrs. Visibility was extremely poor with thick mist.After long time wait slowly-slowly the curtain of mist was removed and the sacred mountain has given its darshan to us only for 10 secs., and then it was hidden again in the clouds. we felt very blessed. Adi-Kailash is populerly known as Chota Kailash with elivation of 6091m, it is an area of great netural beauty, peace and serenity in the great Himalaya. 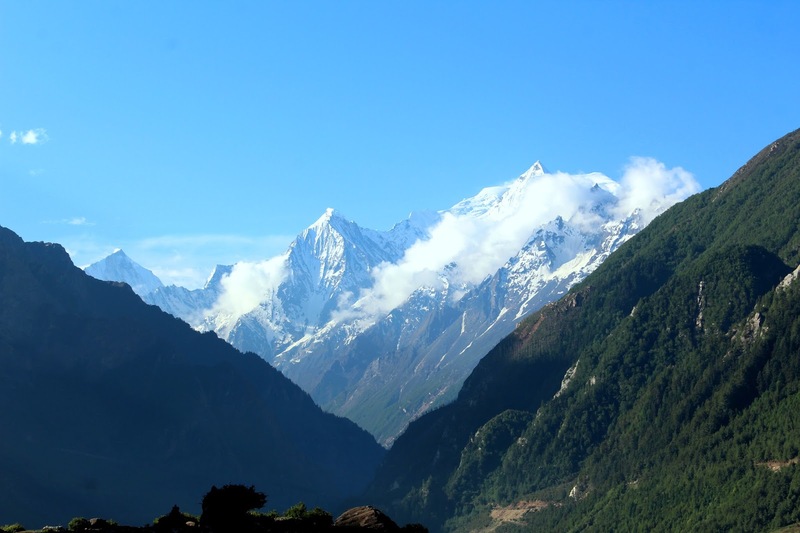 Adi Kailash is only peak in the range which has great fame among the Indians trekkers and pilgrims due to its sacred status and spectacular profile. Mt. Adi- Kialash is true replica of Holy Mount Kailash. 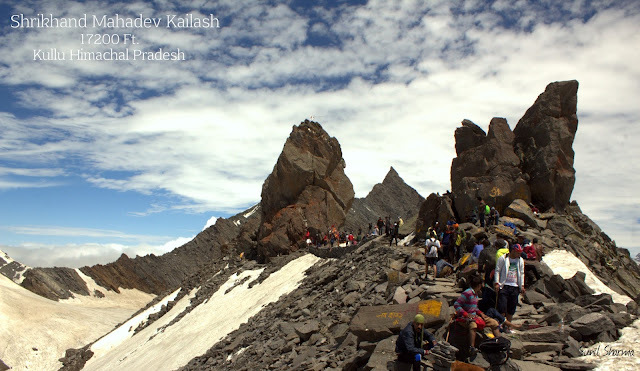 Adi Kailash is considered Lord Shiva's oldest abode. 'Ravana' is the biggest follower of Lord shiva. Ravana comes from south(Lanka) to the far north Adi-Kailash to pray Lord Shiva. After darshan we returned to our camps and get ready for our journey back to home . The same day we decided to reach Kuti. On the return journey heavy rain was our biggest hazard, due to heavy rain two small bridges broken and huge land slides was occurred on the way. 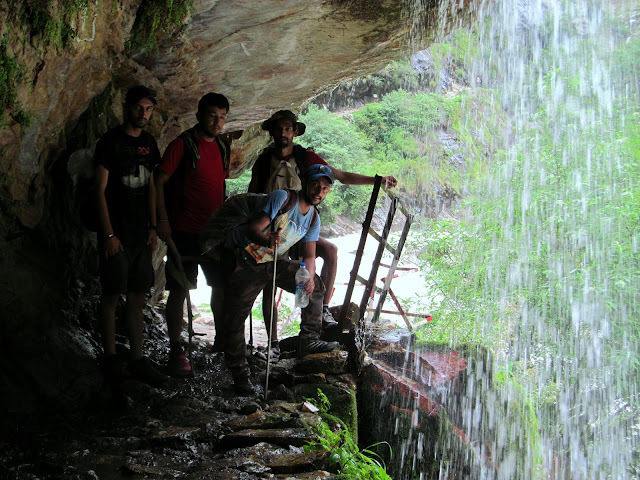 That is very challenging to us, we reached Kuti in the evening and stayed there . One of our trek companion fell sick at Kuti, we gave him dry warm clothes and some medics. After long night rest next day we took him to Gunji camp and gave him proper medical facilities and care. 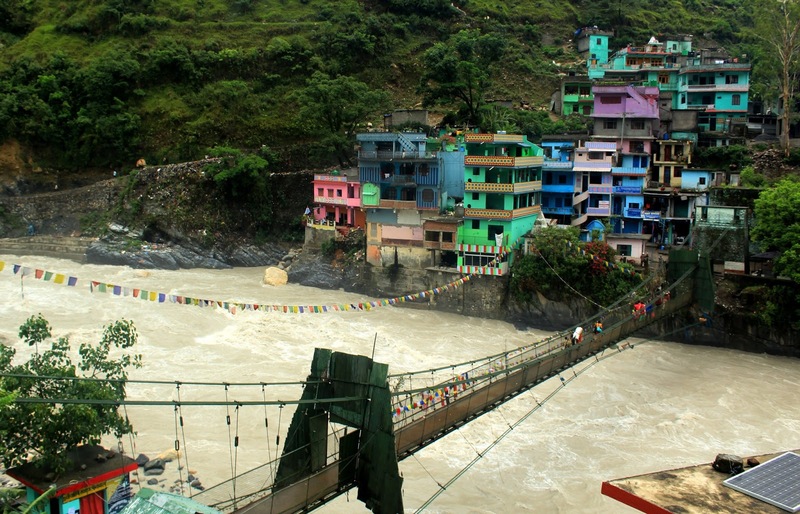 we stayed over night at Gunji.At gunji we came to know that the entire Uttarakhand Region had been experiencing heavy rain. The next day the patient was ok and ready for the descend . After breakfast at Gunji we descended to our base camp at Garbadhar (Pangla). Trek route of Adi-Kailash passes through the Darma, Byans and Chaudans Valley.Walks in the villages of Malpa, Budhi, Grabyang(Sinking Village) , Gunji, Nabi and Kuti are very cultural and exhilarating.We took over night rest at Pangla and next morning we were on board to our journey back to home. We were on the same route to our return journey, all ascends became all descends but in the different moods and experiences . The route where it was sunny during the ascend has become sometime opposite. In this very exciting trekking region of Adi-kailash yatra we came across the mighty splendour Himalayan peaks, lushing green valleys, rich cultural heritage villages, the gushing and dangerous Kali river and calm Kuti river, thick forest, number of waterfalls and rare variation of wild flora and founa. 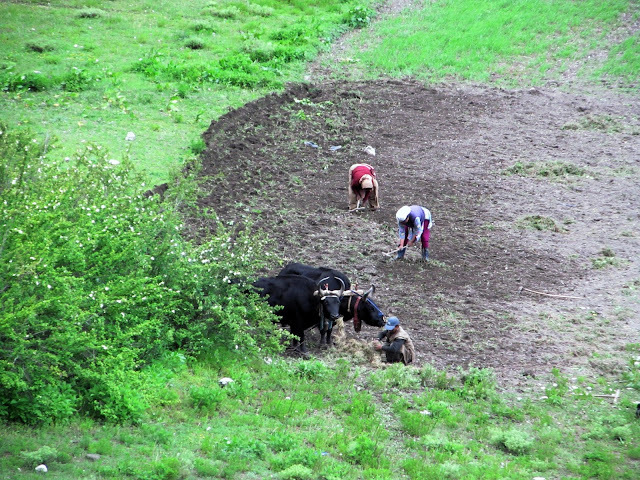 We also get chance of understanding the social life of native people living in the valleys. We are very thankful to SDM Dharchulah, PWD Dharchulah, Civil Hospital Dharchulah and KMVN . 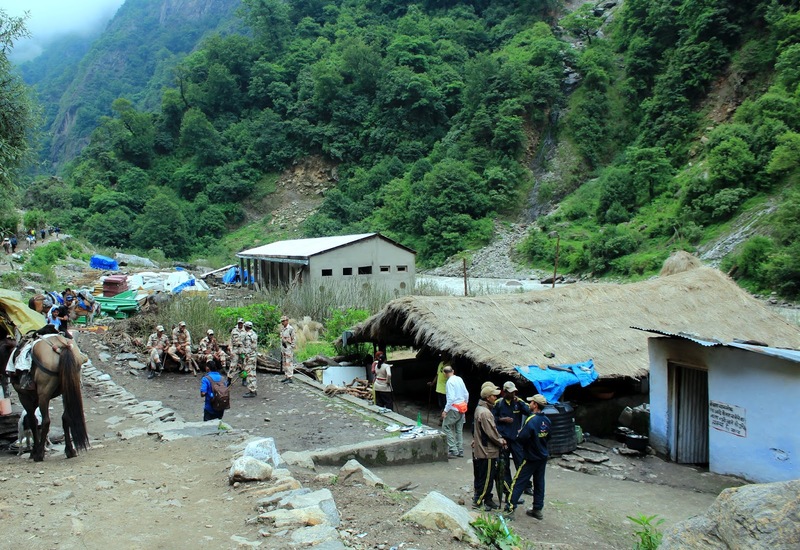 We are also very thankful to ITBP and SSB Forces who are very cooperative on the Trek. This is a very life time experience to us. we are very thankful to our Bus driver, who made our travelling very comfort and safe..
Could you please tell whats the last point till where we can take a car or taxi?